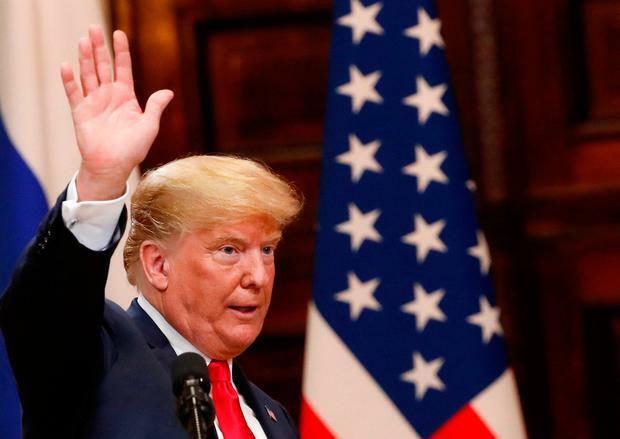 U.S. President Donald Trump said after meeting Vladimir Putin on Monday he saw no reason to believe his own intelligence agencies rather than trust the Kremlin leader on the question of whether Russsia interfered to help him win the 2016 election. Instead, he denounced the "stupidity" of his own country's policy, especially the decision to investigate election interference. Trump's performance is likely to create a political storm in the United States, where the White House has struggled for months to dispel a suggestion that Trump was unwilling to stand up to Putin. His performance was denounced as "treasonous" by a former CIA chief and condemned as "shameful" by a Republican senator, although other Republicans were more cautious. Asked if he believed U.S. intelligence agencies, which concluded that Russia interfered in the 2016 election to help him defeat Democratic candidate Hillary Clinton, he said he was not convinced. At the news conference, Trump was invited by reporters to offer any criticism of Russia but he repeatedly declined. Asked if Russia was at all to blame for the poor ties, he said: "I hold both countries responsible. I think the U.S. has been foolish. We’ve all been foolish," he said, before veering into discussion about his election victory. Asked whether he had wanted Trump to win the 2016 election and had instructed officials to help him, Putin said "Yes I did", although he denied any interference, saying the allegations were "complete nonsense". Republican Senator Lyndsay Graham said Trump's performance would send a message of "weakness" to Moscow. Arizona Senator Jeff Flake, a frequent Trump critic, said: "I never thought I would see the day when our American President would stand on the stage with the Russian President and place blame on the United States for Russian aggression. This is shameful." Former CIA chief John Brennan went further, suggesting Trump should be removed from office: "Donald Trump’s press conference performance in Helsinki rises to & exceeds the threshold of 'high crimes & misdemeanors.' It was nothing short of treasonous. Not only were Trump’s comments imbecilic, he is wholly in the pocket of Putin. Republican Patriots: Where are you???" The summit caps a trip abroad during which Trump accused NATO allies of failing to spend enough on their militaries and embarrassed British Prime Minister Theresa May by saying she refused to take his advice about how to negotiate Britain's exit from the EU. He referred to the European Union itself as a "foe" in trade and repeatedly criticised it. In some of the strongest words yet reflecting the unease of Washington's traditional allies, Germany's foreign minister said on Monday Europe could no longer rely on the United States.